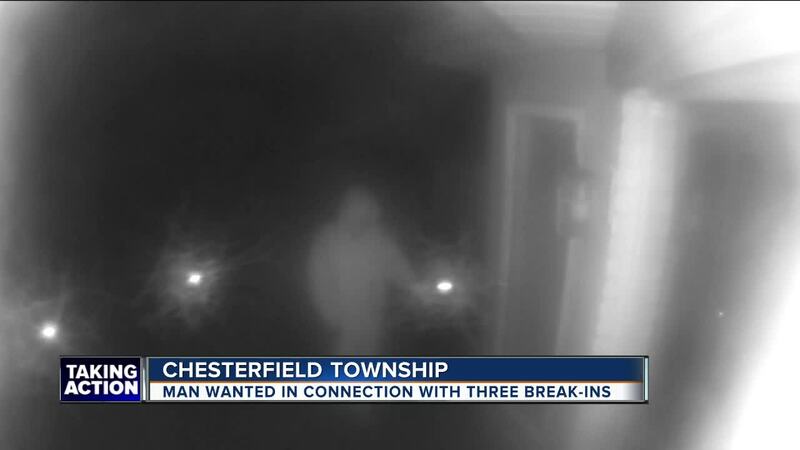 Police in Chesterfield Township are searching for a suspect in connection with three break-ins in that community. CHESTERFIELD TOWNSHIP, Mich. (WXYZ) — Chesterfield Township police say someone is breaking into houses while people are home. They believe they have video of the burglar. Police tell 7 Action News in one case someone left their car door unlocked, so the burglar went in the car and opened a garage door. In the other two cases some left their door walls unlocked - so the burglar walked right in. The first burglary happened on Friday night into Saturday morning in a home north of 23 Mile and west of Sass. Then it happened again Sunday night into Monday morning at two homes in neighborhoods north of 23 mile and east of Baker Road. Chesterfield Township Police Sergeant Kenneth Anderson says police released surveillance video taken at the house neighboring one victim. They want the person caught before someone gets hurt. “We don’t want anybody to get hurt. We could have a homeowner find the suspect in the house. There could be guns involved,” said Anderson.